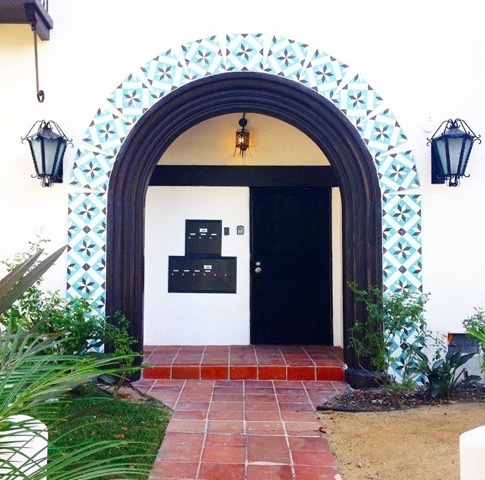 Sometimes even the small touches of Granada cement tile can have a big impact, amplifying the beauty of a kitchen via backsplash, a few colorful cement tiles interspersed throughout an otherwise plain wall or, as here, used the edging of an archway, emphasizing the strong, simple beauty of this Spanish-style home. 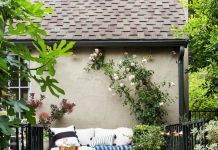 Toscana 980A in black, cream and aqua do the trick here, providing an arresting complement to the traditional rust-colored clay tiles used on the walkway. Make your space a thing of beauty with Granada Tiles cement tiles. 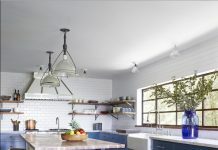 Many of our most popular concrete tile designs, like the Fez encaustic tile in blue and white, the Serengeti concrete tiles in black and cream, and the Cluny cement tiles in black and white, all pictured above, are in stock and ready to ship out to you immediately! The qualities that make Granada Tile’s cement tiles the choice of award-winning coffee shops and hot restaurants around the country — along with their beautiful designs and vivid colors, our concrete tile is long lasting, easy care and low maintenance — are the same ones that make it perfect for your home tile project, whether used as patio tile, porch tile, kitchen floor tile, kitchen backsplash tile, bathroom tile, shower tile or laundry room tile. 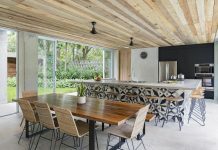 Start by visiting our cement tile shop to peruse our large selection of in-stock handmade master-crafted cement tiles and then call us today at 213-788-4238 to discuss which of our encaustic tile designs would be perfect for your home or restaurant project. We’re sure you’ll fall in love with them before the grout even dries!